Chinese President Xi Jinping depicted the deep friendship between Chinese and Portuguese in his signed article titled “A Friendship across Time and Space, A Partnership for the Future” published on Portuguese newspaper Diário de Notícias ahead of his state visit to Portugal. Nowadays, more and more Portuguese are learning Chinese and the “Chinese fever” is continuously heating up, indicating the increasingly deepening cultural exchanges and cooperation between people from China and Portugal. 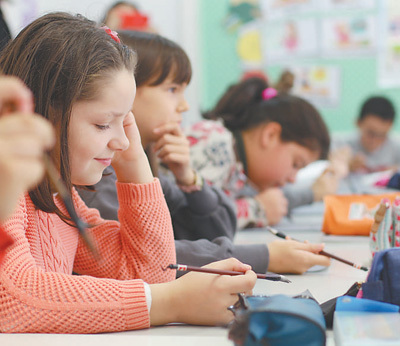 “Practicing calligraphy is as interesting as painting!” “It’s cool to learn Chinese.” These are the comments of students from Parque Primary School in São João da Madeira, Portugal where Chinese is a compulsory course. With a calligraphy brush in their hands, more than 20 students are learning to write “one, two, three and four” in Chinese characters under the guidance of a Chinese teacher and a Portuguese teacher. About 700 students are learning Chinese in São João da Madeira, introduced the city mayor Jorge Vultos Sequeira. Six years ago, Chinese has been introduced to the compulsory curriculum for grades three and four of all public elementary schools in the city. In addition, students can continue to learn Chinese as an elective course from the fifth grade till they graduate from junior middle schools. Sequeira’s nephew is also a Chinese learner. Every time they meet, the little boy will sing a Chinese song and write Chinese characters for his uncle. “China is a distant and mysterious country for children, but learning Chinese has given them a super power to know more about the country,” said the mayor. The two-year compulsory Chinese course, once in a week, is not enough for the students to speak fluent Chinese. However, it is important that the course can plant a seed in their hearts. In this sense, China and Chinese language are not strange to Portuguese children and turn out to be childhood memories that accompany them to grow up, said Sequeira. “Cherries plus Chinese equal beautiful life,” published by an 18-year-old Chinese learner named Francisco Silva from Porto on friend zone of WeChat, a Chinese social media platform. With just 7 months’ study of Chinese, Francisco passed Level IV of the Chinese Language Proficiency Scales for Speakers of Other Languages. He is not only able to communicate fluently in Chinese but also writes Chinese characters well. In this October, he took part in the “Chinese Bridge” in Aveiro, a worldwide Chinese Proficiency Competition for Foreign Secondary School Students and won the most creativity award. There is no Confucius Institute in Porto. Francisco Silva has to travel 77 kilometers from Porto to the Confucius Institute of the University of Aveiro by bus and train every week to attend the 3.5-hour Chinese class. “I’ll never stop learning Chinese. My dream is to speak Chinese like native speakers,” said Francisco Silva. 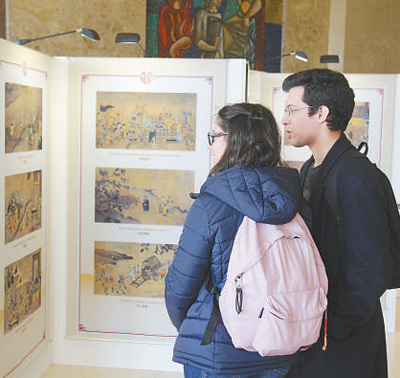 An increasing number of young Portuguese comes to love Chinese culture, said Carlos Morais, the Portuguese director of the Confucius Institute in University of Aveiro. In Aveiro District, there are 112 classes in total and 2,500 registered students at Confucius Institute. Chinese class is also availabe at Macau Science and Cultural Center in Lisbon, and its students are usually aged between 17 and 24. For young generation, learning Chinese is not only an interest, but also a skill, because China and Asia mean future and hope, said Luis Filipe Barreto, director of the center. “In the eyes of young people, mastering Chinese means the golden key to future,” said Barreto, expressing his hope to add Chinese into the curriculum of public junior middle schools in Portugal. Promoting Chinese as a compulsory course is a long-term effort, said Sequeira, adding that they are planning to cultivate a batch of talents who are capable of boosting Portugal-China trade relations in order to develop local economy. “China means opportunity, which is the most unpretending belief of Portuguese people,” Sequeira noted.